ExtremePhysics is a 2D rigid body simulation engine designed for Game Maker. The DLL is written in C++. World: This class connects the other classes. You can create multiple worlds, but most of the time one world is all you need. 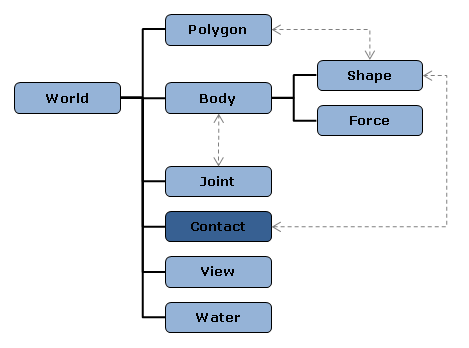 Polygon: Polygons are used to define the vertices of polygon shapes. Body: A body is the equivalent of an object in Game Maker. Usually every object in Game Maker is associated with one body. Shape: Shapes are used to define the shape of a body. There are three types of shapes: box shapes, circle shapes and polygon shapes. One body can consist of multiple shapes. Force: Forces can be added to bodies to simulate some effects, e.g. a rocket engine. Contact: This is a special class. You can't create or destroy contacts, because contacts are created and destroyed automatically by ExtremePhysics during the simulation when different shapes collide. Contacts can be used to detect collisions. Joints: Joints are used to connect bodies. There are multiple types of joints. View: Views can be used to speed up the simulation for games that use views. Parts of the world that are out of view can be put to sleep to save processing time. All angles in ExtremePhysics are in radians. Note that the game start event is executed after the create event, therefore it's a good idea to create an empty room (room_gamestart) with one object (obj_gamestart) that executes this code before going to the next room, to make sure this code is executed before anything else. If you forget to initialize the DLL, you will get an error message when you try to use the scripts ("undefined variable global.define_ep_functionname"). I will explain the meaning of this code in a separate tutorial. There are two kinds of bodies: static and dynamic. Static bodies can move, but their movement isn't influenced by other bodies. The movement of dynamic bodies can be influenced by other bodies (even static bodies). Static bodies are used for things that can not be moved by other bodies (e.g. the ground, walls, platforms that move at a fixed speed). // global.world: the id of the world you created. // global.world: the id of the world. // body: the id of the body you created. // 32,32: the size of the box. // 0,0,0: the relative coordinates of the shape (x,y,rot). // 1: the density of the box (not used for static bodies). This code will create a static box, but the box won't collide with anything. The collision system ExtremePhysics uses takes three values: collision mask 1, collision mask 2 and group. Collision mask 1 and collision mask 2 are 32-bit unsigned integers. Collision mask 1 stores the layers the shape belongs to, collision mask 2 stores the layers the shape should collide with. Every bit is one layer, so you can use up to 32 layers. If collision mask 1 matches collision mask 2 or collision mask 2 matches collision mask 1, the bodies will collide. But if they are in the same group (not group 0), they will never collide. // 1: collision mask 1 (binary 00000000 00000000 00000000 00000001). // 1: collision mask 2 (binary 00000000 00000000 00000000 00000001). // 0: group (0 means no group). // 0.5: coefficient of restitution. // 0: normal surface velocity. // 0: tangential surface velocity. // x: x coordinate of the body. // y: y coordinate of the body. // degtorad(image_angle): rotation of the body, in radians. Creating dynamic bodies is almost the same as creating static bodies. There is one extra argument for dynamic bodies: norotation. If norotation is true, the rotation of the body will not be influenced by other bodies (because the moment of inertia of the body is infinite). // false: this body can rotate. You have to set the center of mass, mass and moment of inertia of the body before you can use it. The easiest way to do this is calling ep_body_calculate_mass. This function will calculate the center of mass, mass and moment of inertia of the body based on the shapes you have added to the body. // 32: the radius of the circle. // 1: the density of the circle (not used for static bodies). Creating polygon shapes is more complicated, because you have to create a polygon first. A polygon can be used by multiple bodies, so usually you can create all polygons immediately after creating the world. // 3: number of vertices. // -10,-10: coordinates of the vertex. // +10,+10: coordinates of the vertex. // -10,+10: coordinates of the vertex. Vertices have to be declared in clockwise order (in a left-handed coordinate system). All polygons have to be convex. If a body is concave you have to create multiple convex polygons. You can use multipolygons to accomplish that. // global.poly_triangle1: the id of the polygon. // 1: the density of the polygon (not used for static bodies). You can't destroy a polygon if it's still in use. You have to call ep_world_update_contacts and ep_world_simulate_step to simulate one step. Usually this is done in the end step event of the controller. After simulating a step you have to update the position and orientation of the objects in Game Maker to see the results of the simulation. This is usually done in the end step event of the objects. When a world is destroyed, all polygons, bodies, contacts, joints and views that belong to the world are destroyed. When a body is destroyed, all shapes and forces that belong to the body are destroyed. I am simply amazed. Thank you so much for these tutorials. I shall stop by every now and then to see what might have been added. I would say that I am an intermediate when it comes to programing and that this is far beyond me. However, your tutorials make perfect sense. One question: Are these codes free to use in other programs? It is exactly what I need for a game of mine created with GM. The code in this tutorial is of course completely free. The source code of the DLL is distributed under the terms of the GNU Lesser General Public License, which means you can use it in any project, but if you start making changes to the source code you have to make those changes public under the same or a similar license. If you're just using the DLL or the extension in GM, then it is "free to use, also for commercial games". Maarten, could you provide me with an example room of a soccer ball being dropped at an angle from a height and bouncing on a solid floor until it stops? I think that would go a long way in helping me understand how to set up the world and how to attach a sprite to a physics object. I've added a simple platform example yesterday, it should give you a good idea where to start :). Cool! Thanks, Maarten. I'll check it out. endstep(); should be in the end step event of the controller, not in the end step event of the ball. You should use ep_body_set_gravity if you want the ball to fall. I would use ep_body_set_gravity like this right? I've been using this physics engine and I love it! In the Create-event, the code editor says that there is a wrong number of arguments in this function. :S Please answer! I tried to combine http://www.yoyogames.com/games/54283-chain-example and your platform_example, but if I put End Step event to ball_object , I am no longer able to move it and without it, the collision does not work with obj_crate. I wonder what I have to do with it? You can also use ep_body_set_damping in the create event, that function does exactly the same :). That code works for me. Are you sure you're using the latest version (2.2)? Ok, thanks, but now I have even bigger problem. I am new with Game Maker and normal movements are still hard to me. Can you make me an example how these functions works with mouse, if it is possible? Well, you have to understand the normal movement system first. Otherwise you won't understand the ExtremePhysics functions either. Did you read the official Game Maker tutorials? i don't understand why does a circular object bounce up even when its rolling on a flat surface??? what should i do to prevent that from happening??? That's probably because the flat surface consists of many separate blocks in your game. You can reduce the effect by using a higher framerate (60 instead of 30) or substeps, i.e. simulating multiple steps per actual frame. The only way to actually eliminate the effect is to use a single shape for the entire surface. Take a look at the 'merging walls' example, if your game is grid-based that should be enough. The DLL is in the same directory, I've checked that multiple times, but there is always this error. What have I to do now? You have to import the scripts (gml file) too if you want to use ExtremePhysics that way. But normally you would use the extension instead of the dll + scripts, so you don't need either of them. You don't have to call extremephysics_init if you use the extension. Hi Maarten. Thanks for all your great work on ExtremePhysics. I am new to the product and very excited to learn more. I am having a beginner problem. In trying to learn the very basics of creating static and dynamic objects I am recreating one of your examples "engine_example.gmk" to try and undersand the creation flow as I follow the tutorials. When recreate the Create Event in the static block object, I get a failure on Physics_object_set(body); I have redone it several times and have had no success. I would be greatful is you could explain why I am getting the error on this one function...so far. I am using the Extension rather than the DLL. It's a script, not a function :). It calls ep_body_set_position. You can also use that function directly instead of using my script, the script is just a bit easier. Thank you for your fantastically quick response and the great information. Now I have moved on to dynamic objects and am having a failure on two other issues. All these functions work in your examples. When I use exactly the same code in my test example, they fail. Can you help me again, please. And are there any other issues like this? Again, they are scripts :). Forgive me for being a complete idiot. I knew about and completely overlooked the 3 scripts in your examples. Hi again Maarten. I have another very basic question. am creating various polygons. I have done a hexagon and used the same code for a previous, but differently shaped polygon that works perfectly. My code shows no errors, but when the program is run in GameMaker the object speeds around the screen erratically then leaps out of view after knocking several other objects out of place. The verticies were done by Polygon Creator and are in the Controller after the world creation as per your direction. The create event code is apparently where my problen is. I am not sure what the variable for each function should be. Your reference information shows what each of the variables are, but I am confused over what they should be for various objects. Does anything look glaringly wrong to you? I would appreciate any help you can provide. I really enjoy working with ExtremePhysics. Even more so as I learn new bits and pieces. Your code looks okay, so I suspect there's something wrong with the code that creates the polygon. Could you post that one too? By the way, have you tried debug drawing? That usually helps a lot. I hope this gives you some assistance in figuring out what I am doing incorrectly. That looks correct. Does debug drawing show anything useful? I complete removed all traces of my previous code and built it from scratch again. Thank you for your rapid responses and assistance in getting me past another 'junior road bump'. I am working on a simple 'shooter game. I have 10 different dynamic objects with 10 different sprites. When I knock all 10 0objects off the screen I want to go to the next level. I use the Gamemaker language or drag and drop to check for any remaining objects on the screen. When they are all gone, the game will not change levels. I there anything 'unseen' that is left behind when a dynamic objects sprite falls off screen? I understood the dynamic object and its sprite were connected and moved as one. ?? Or am I just having a problem with my gamemaker code? This may not be the proper section to post a question of this nature. If not, I apologize. This should work, it doesn't matter whether you move the instances manually or let ExtremePhysics do it. I think the problem is in your code. How are you checking whether there are instances on screen? The problem was indeed my own code. ExtremePhysics is working perfectly for me. Does this one work on GM Master? I try the demo program but it does not work. It show up "Error: GM functions could not be initialized!". Seem like the ep_gm_functions_init() return error. I'm not sure what you mean by 'GM Master' - GM Studio? Debug drawing doesn't work in GM Studio and will probably never work because it's essentially a hack. There's not much I can do about this, especially since get_function_address is gone. I have a program that requires a platform moving back and forth horizontally. I need the platform to be a static physics object. All it does is move left and right. I do not want a dynamic 'bullet' to pass through the platform. The routine for moving the platform works perfectly. The sprite object the physics object is attached to moves, but the physics object remains stationary. I can shoot where the object was originally placed while the visible sprite is moving and the 'invisible' physics object is still in the original location. Sorry for the long post, I was trying to be as clear as possible. How can I cause the physics object to along move with the platform so a dynamic bullet will bounce off and not pass through it? My moving platforms work perfectly. Extreme Physics is a really great extension for GameMaker. But it can not run properly on GMS(even on Windows), all instances are stack at the top of room, include static objects. All code are copied from Getting Started tutorial. Make sure you are using the extension for Studio. I have heard that it works for some other people, but I don't have Studio so I can't really help you there. PS: Debug drawing doesn't work in Studio, I can't fix that because YYG removed the function I needed. Yes, I'm using the extension. And I started my project over again, this time is different: everything falls correctly but they don't collide with each other. Sure, but are you using the extension for Studio? There are two extensions, and only one will work in Studio :). Make sure you have the latest version of ExtremePhysics as well. Yes, Extreme Physics 2.2 for Studio. Probably my GMS version is too high. Please don't post these links here. Have you tried any of the examples? Do they work? If you can create a GM7/GM8/GM8.1 version that has the same bug, I can take a look at it. Sorry about that link. I tried engine_exmaple.gmk in GMS. All dynamic objects stack at top-left corner of the room. That bug usually happens when you try to use the non-Studio extension in Studio. Are you sure that you have the Studio version? What steps did you follow to install it? IIRC you need to run GM as administrator to install extensions (this may have changed in Studio though). What version of ExtremePhysics do you see in the extensions dialog? It should be 2.2 release 15 (the release number is important). To start off with I am just trying to get a ball to fall down, but I seem to be having trouble with it. The ball just floats there. I am using the extension package that is NOT labeled studio. Also, for some strange reason whenever I open up one of your examples in GM8.1 they appear to be blank. @Kristian221: You forgot ep_body_set_gravity :). Hi, I am here to ask you, and very thank you, all my gm project are based on your awesome physics. My issue is that I bought YOYO Compiler (YYC) for GM Studio, EP 2.2 seems to not working with YYC. Is there chance that it will run? I don't have Studio, I have no idea. Do other DLLs work with YYC? I wouldn't be able to open the example since I don't have Studio, but I'd like to know how you made that work. I have only EP, but its good ide to try some alse. I see. That may still be useful for other users. Can you post the code here? If it's too large, you can use pastebin.com. There is download link of my Example solution that allows debug draw bodies in Game Maker Studio. GM Studio does not support ep_debugdraw_bodies natively, so I helped myself, and maybe it will help you also. everything easy to use, I can post it if there is someone interested. For most practical purposes that's enough. If you really want to follow the rules to the letter, then you have to also host the ExtremePhysics source code on your own website or include it with the Steam game itself, but in practice most people just link to the original project website since it's much more convenient. One small thing about the LGPL is that you have to allow users to replace the ExtremePhysics DLL, if they want to. So you can't e.g. calculate MD5 checksums of the library to check that it hasn't been changed, that would break the LGPL. The idea is that people can replace outdated versions with more up-to-date versions to fix bugs etc. I doubt that anyone will actually do that, but that's just how the license works. so I include EP in licence folder, in state I downloaded it from your page? if I never heard of MD5, its automaticly OK?